The braking distance, also called the stopping distance, is the distance a vehicle covers from the time of the full application of its brakes until it has stopped moving. This is often given as a 100-0kph distance, e.g. 56.2m, and is measured on dry pavement. Occasionally the time taken to stop is given, too. However, while this seems like a simple case of getting in a car, driving at a certain speed, slamming the brakes on and measuring the distance, the actual physics and mechanics behind the process are quite complex. For example if the test is performed on an aircraft runway in the dry the stopping distances will be much shorter than a regular road in the dry because airport tarmac has more grip than regular tarmac. If the conditions are wet or damp, there will be less grip and the stopping distance will be further. If the tyres are under- or over-inflated this will affect the stopping distance, as will the quality of the brake pads and the brake balance. Prior to anti-lock brakes, a driver would need to be skilled to get the maximum braking potential out of a vehicle without locking the wheels, causing a skid. Now, ABS means you can apply the maximum braking power immediately, which shortens the distance. Other electronic safety aids such as electronic brakeforce distribution ensure that braking power is dynamically assigned to each wheel in varying amounts as the relative grip of the surface changes. This means that a vehicle could have two wheels in gravel on the side of the road and two wheels on the tarmac and still brake in a straight line because none of the wheels would lock and skid. An important component of the overall stopping distance in real life is the driver’s reaction time. While a racing driver who is expecting to have to brake might react in half a second or less, drivers in real life are relatively complacent and reaction times of 1.5-2 seconds are the norm. In older drivers this can be as high as 2.5 seconds. Brakes slow a car down using friction. Calculations of stopping distance assume that each wheel’s brakes are strong enough to lock the wheel and won’t suffer any fade over the distance of the braking exercise. Different types of brakes have different levels of efficiency and consistency. Most cars have disc brakes. This image shows the front discs of an FPV GT with cross-drilled and slotted brake rotors – a sports-oriented brake package. Rolling resistance is caused by gravity acting on the tyre which causes it to deform where it meets the road. This uses energy – i.e. some of the forwards energy is translated into the energy required to deform the tyre. This is a minor factor. Most modern cars are fairly aerodynamically efficient and don’t offer much wind resistance. The effect of wind resistance is more at high speeds, but still not that much in terms of slowing a car down, unless it’s a strong headwind. Some sports cars such as the McLaren MP4-12C, use their spoiler as an air brake, tilting it up to provide a flat surface against the flow of air over the car, and improve the braking distance. This is expensive and not practice in a normal road car. The friction of the tyres on the road, as the tyres are being slowed down by the brakes, is the main force behind short stopping distances. 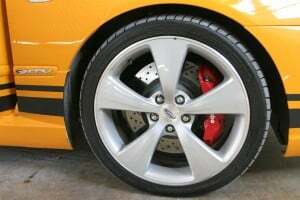 If too much force is applied to the brake discs by the brake callipers this will cause the tyres to overcome their limits of friction and the wheels will lock. The type and condition of the road, plus the temperature and how wet it is, affect how much friction the road has. The consistency of the tyre rubber, the tread pattern and the inflation pressure affects how much friction the tyre has. The gradient affects the stopping distance through the influence of gravity. If the car is travelling uphill, gravitational forces acting against the motion of the car will make it stop more quickly; if it is travelling downhill, gravity tries to keep the car moving, which will extend the stopping distance. When a vehicle brakes when towing a trailer, the trailer pushes the vehicle forwards if the trailer doesn’t have its own brakes. The figures above are from the Queensland Government Department of Transport and Main Roads as NZ Transport Agency does not give any definitive figures. 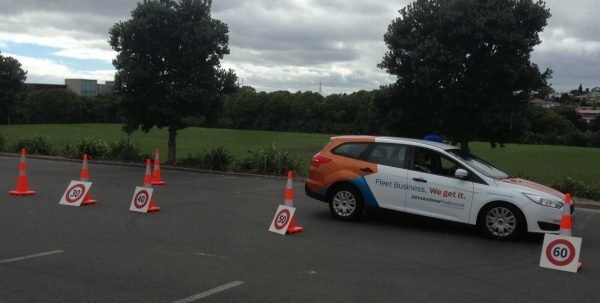 However, we attended a braking demonstration using a brand new Ford Fiesta station wagon on a car park at Trusts Stadium in Henderson. The position of the cones shows the stopping point of the nose of the car at various speeds. This is less than the figures given, but the car was brand new on new tyres and is a fairly light car. The car stopped in less than its length from 30km/h, about its length at 40km/h, double its length at 50km/h and triple its length at 60km/h. If the above hasn’t explained it well enough, perhaps the raw physics will help.